September 14, 2018 |Deepsky, Nebulae, Nova/Supernova etc. Supernova remnants (SNR) are formed when a large star ends its life in a supernova explosion. About 300 of these remnants are currently known in our galaxy. 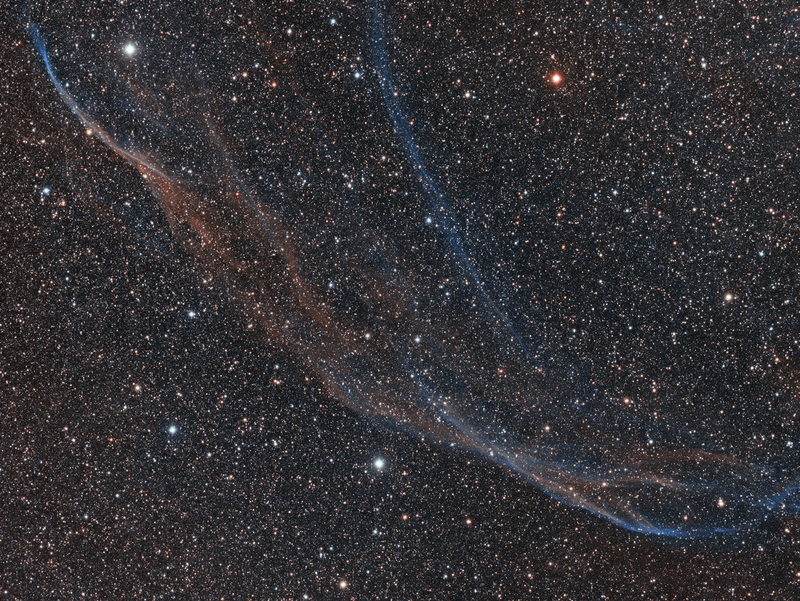 One of the most famous remnants, the Veil Nebula, is located in the constellation of Cygnus. Although this is the most famous one in this constellation, it’s not the only SNR. Cygnus contains several obscure SNR’s, among which SNR 65.3+5.7 (also known as SNR 65.2+5.7). SNR G65.3+5.7 was discovered by Gull et al. (1977) during an OIII survey of the Milky Way. Some parts of this SNR were already catalogued by Stewart Sharpless in his SH2 catalog as SH2-91, SH2-94 and SH2-96, but they were not recognized as being part of a bigger structure at that time. The idea that they could be part of a larger SNR was postulated by Sidney van den Bergh in 1960, but it took until 1977 for this to be confirmed. This is one of the larger SNR in the sky spanning a region of roughly 4.0×3.3 degrees. Mavromatakis et al. (2002) determined the age of the SNR to be 20.000-25.000 years and the distance about 2.600 – 3.200 lightyears. The shell has a diameter of roughly 230 lightyears! This SNR is a predominantly OIII shell with also some H-alpha signal. This supernova shell is quite weak and there are hardly any high-resolution images of this region. In the internet maybe 5-10 deep images of this shell can be found and, in most cases, they don’t cover the entire shell or the resolution is quite low because it was done by using photo lenses at short focal lengths. That’s why I decided to see if I could try to image the entire shell using my equipment, a TMB92 refractor in combination with a QSI583ws ccd camera. Because of its large size I needed to make a 3×3 mosaic to cover the whole region. During the summer of 2018 there was a prolonged period of clear nights and I decided to spend 1 night per frame to try to grab the faint OIII emission of the shell and later maybe the H-alpha data to combine these. Because of some nights with faint cloud layers I needed about 12 nights to gather the data, where 1 frame (top right corner) could not be finished in time during this season. This will be on the list for next year. Fortunately, this region almost doesn’t have any OIII emission, so it could be left out for the moment. As so many nights were already necessary to cover the region in OIII I didn’t succeed in grabbing the H-alpha data, but on the internet I found the MDWsurvey (mdwskysurvey.org) initiated by David Mittelman (†), Dennis di Cicco, and Sean Walker (MDW). This is a marvelous project with the goal to image the entire northern sky in H-alpha at a resolution of 3.17”/pixel. I contacted them and told them of my effort to grab imagery of this SNR and they were very kind to provide me with the H-alpha imagery of this region, so that the entire SNR could be brought into view in reasonable high resolution. To make the entire shell visible it is necessary to combine H-a and OIII imagery as these are complementary datasets that fill each other’s gaps. Regions where there is no H-a data are filled with OIII signal and also the other way around. The inverted image and the monochrome image show a combination of about 43h of OIII data (made by myself) and 20 hours of Ha-data (made by the MDW survey) in a single image. In this way the full span of the shell can be seen in all its glory. The inverted image highlights the faint structures which are more easy to discern to the human eye in this way of projection. The final plan is to create a bicolor image of this region in time, but because of some problems of the OIII frames in the right part of the image, and the missing top corner, that will be done probably next year. To give an idea of what can be obtained the image below shows one of the frames in H-a/OIII bicolor. In the first years after its discovery several papers were published about this SNR. But as soon as radio, optical and X-ray observations were done the remnant was abandoned by most researchers and no attention was given to it. In 2004 a new study was published by Shelton, Kuntz and Petre which showed this SNR to be the oldest known remnant of a so-called Thermal Composite SNR (or mixed-morphology SNR). The free expansion phase is independent of the kind of supernova explosion. During this period all materials are accelerated outward and the evolution during this phase only depends on the amount of energy released during the explosion. Velocities of the expanding shell can be up to 104km/s. During the adiabatic phase the shell continuous its expansion, but starts to decelerate because of the presence of the interstellar medium. During this phase the energy is conserved and the temperature increases towards the center of the expanding shell, while the pressure in the center approaches a zero value. During the radiative phase the energy of the shock is dissipated by the interstellar medium and the remnant becomes a very thin, dense shell of material which cools rapidly. The interior of the remnant can remain hot. During the cooling the materials will cool down below the recombination temperature of the atoms and the materials will dissipate into the interstellar medium. In a thermal composite SNR the SNR has reached the radiative phase but still has a significant x-ray emission from the inner part of the shell caused by thermal radiation. One of the theories is that this happens to supernovae that take place in large molecular clouds where the expanding shell collides with the surrounding materials. The article of Boumis et al. (2004) shows that the SNR has a barrel-shape which expands with an average velocity of 155 km/s which is not enough to explain the x-ray emission of the nebula. It is thought of that the supernova took place in a cavity that was created by a progenitor explosion. It could be that the shockwave of the second explosion passed the shockwave of the first explosion and as such gives rise to a merger of the two shells.